Yesterday’s presentation – though cast to the hilt, sumptuously presented in the lush cabaret surroundings ideal to the story’s 1950s London clubland setting and supported by the Arts Council – was a trimmed-down, 90-minute showcase version. The producers aim is to mount a full-scale production next. 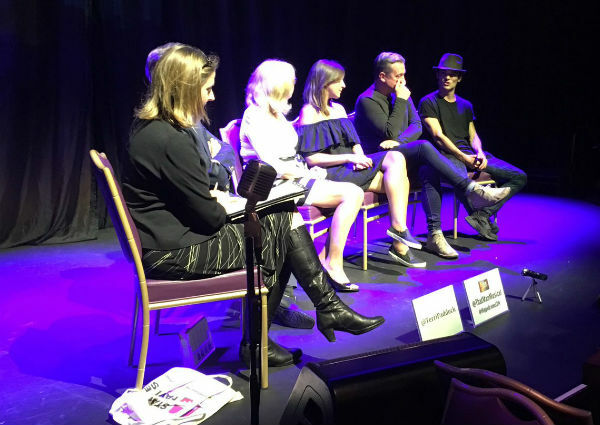 For the Q&A, I was joined by Wendy and director Paul Boyd, along with That Man stars Jonny Labey, Sabrina Aloueche and Christopher Howell, who had just six days to rehearse the piece and a mere four hours to get it into the Hippodrome before yesterday’s 4pm matinee. Wow! There are also interjections from producer David Orchard and audience members from the floor. Apologies in advance for some sound issues on this podcast – some hiccoughs with mikes, air-conditioning and moving furniture. For more information on That Man and for updates on its future development, visit the show website at thatmanmusical.com.